Origin and Habitat: Mizque amd adjacent areas, Cochabamba, Bolivia. Altitude: 2400-3200 metres above sea level. 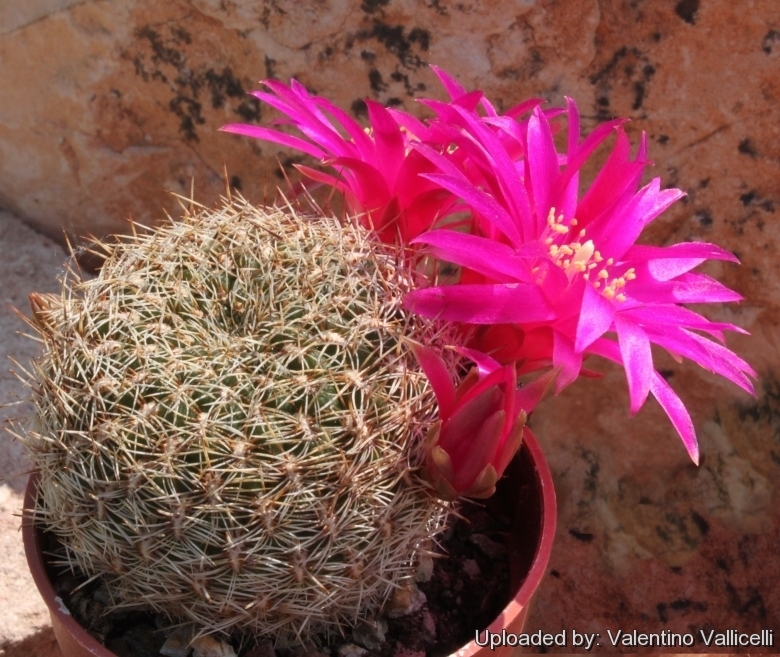 Description: Sulcorebutia mizquensis, is a local or morphological form of the very variable Rebutia steinbachii . It is a choice solitary plant with dark green stems, white or brownish pectinated spines, pointing diagonally and downward. Flowers pink-violet or magenta. Rebutia steinbachii var. mizquensis is apparently a neotenic variety of the species in which juvenile spination is retained throughout the life of the plant, while most of the other varieties are dimorphic (short spined juvenile forms transform at maturity to strongly spined forms). Habit: It is a low growing cactus, at first solitary, forming with time, especially in cultivation, clumps of many heads. Stem: 24-40 mm tall, up to 50 mm wide, flattened globose, greysh-green to dark green sometime tinged red. Ribs: Approx 13, spiralling, poorly distinguished, forming oblong rhomboidal grooved tubercles. Areoles: Long narrow depressed with short grey felt (almost naked) 3-6 mm long, 1,5-2 mm large. Radial spines: 9-12 (or more) about up to 20 mm long, fine, addpressed against the body, pectinate creamy to brownish, pointing diagonally and downward, ± curved slow to develops, frequently absent on new areoles at plant apex. Central spines: None or rarely 1 to 3, only slightly stouter of the same colour of the radials. Flowers: Arising from monoflorous areoles, in lower lateral flower zone. Rarely more than 3,5 cm long and 4,5 in diameter, pink, red or magenta often with paler inner petals. Floral tube funnel-shaped, with broad naked scales. Cultivation and Propagation: Rebutia steinbachii var. mizquensis loves a very permeable, coarse mineral soil as well as to be strictly kept dry throughout the winter quiescent period since it is very sensitive to any moisture excesses, To prevent rottenness it is also advisable to surround its root neck by very rough sand or grit, this help a fast water drainage and an appropriate air circulation. Frost Tolerance: Plants are and quite frost hardy -5 (-15)° C but prefeably overwinter in a cool place (at 0/10°C) this is important for the flowers as well as for plants health. Without this cool winter period they normally wont get any buds.